Can China Live Up to Chen? 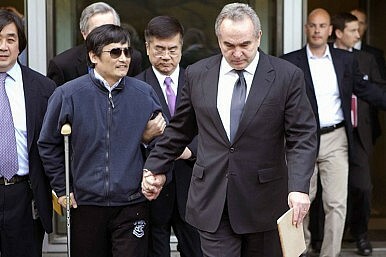 Activist Chen Guangcheng has given a nuanced, optimistic account of China’s future. Can its leaders follow suit? Politicians and pundits in Washington have it all wrong. Chinese activist Chen Guangcheng isn’t going to be a political football in U.S. election year politics or a poster boy for one side of a domestic debate or another. Rather, Chen has the potential to emerge as the most potent weapon in China’s otherwise fairly dismal arsenal of soft power. In his moving and often profound commentary on May 31 here at the Council on Foreign Relations, Chen revealed himself as an optimist and a Chinese patriot: optimistic about his own future and ability to travel back and forth between China and the rest of the world; optimistic about the inherent goodness of the Chinese people, who want to do the right thing; and optimistic that democracy – in one form or another – will emerge sooner rather than later in China. Of course, part of Chen’s story underscores the dark side of contemporary Chinese political life: the extreme and pervasive levels of corruption and violence – who knew that a senior Shandong official blew up his mistress of thirteen years with a remote-control bomb? – the continued threats to the safety and well-being of Chen’s own family members who remain in China, and the utter system of lawlessness that pervades the local system of governance. Yet, Chen, in his remarks, never wavered in his belief that time was on the side of right. For the United States, Chen’s message was clear: keep human rights at the top of the agenda in the bilateral relationship. He didn’t call for Washington to ignore the broader relationship, but for him, human rights are the most essential value when compared with any other interest. Moreover, as he noted, China is in the midst of an historic transition and external pressure can play an important and positive role. For the most part, however, Chen, like many Chinese and outside observers, recognizes that change in China will be fundamentally a function of the Chinese people – the path they choose, and the steps they take. And here too, he is an optimist, noting that the ability of the Chinese people to disseminate information means that change will come quickly. In the end, Chen accomplished in an hour of free speech what the billions of dollars behind China’s go-out media strategy have never achieved: a balanced and nuanced portrayal of this complex country that left his audience with not only a better understanding of China, but also a greater admiration for the Chinese people themselves. Now it’s just up to Beijing to live up to Chen’s faith. Elizabeth C. Economy is C.V. Starr Senior Fellow and Director for Asia Studies at the Council on Foreign Relations. She is an expert on Chinese domestic and foreign policy and U.S.-China relations and author of the award-winning book, 'The River Runs Black: The Environmental Challenge to China's Future.' She blogs at Asia Unbound, where this piece originally appeared. While taking aim at Chen, the editorial is clearly aimed at other dissidents who might want to follow in his footsteps.